A medical problem was the deciding factor in Melindalittle’s decision to start losing weight. She started with the Weight Watchers program and now she watches what she eats, monitors her calorie intake, and makes healthy food choices. Having to travel for her job and finding healthful foods to eat was an interesting challenge to do regularly, along with engaging in physical activities and staying motivated. 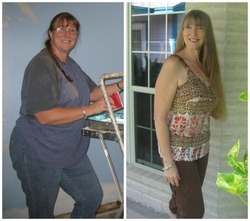 She persevered and has lost 38lbs. About 2 years ago I was diagnosed with Rheumatoid Arthritis. My mother died from complications of the medications she was taking for the disease about a year before my diagnosis. She was for as long as I can remember overweight and struggling with the effects of this debilitating disease. I used the diagnosis as an excuse to let up on exercise. I was struggling with significant joint pain and side effects from the medication as well as serious fatigue (another side effect from RA). Then last Christmas I noticed all of my clothes were either too tight or no longer fit at all, but I had convinced myself that it was due to menopause and medication. The scale at my gym was not working properly so I had been able to pretend for a while that I was not really gaining weight, but when I went to the doctor and the scale said 186 pounds I was blown away. On the day after Christmas I went to buy a couple of new suits for work, and when I realized that size 14’s were too tight I knew it was time to get serious. I have done everything from prescription and over the counter diet pills to Nutrisystem, Jenny Craig and have joined Weight Watchers numerous times. At Christmas last year I joined Weight Watchers for the umpteenth time and actually lost about 20 pounds on it. When I started exercising though I was burning a lot of calories and couldn’t figure out how to make Weight Watchers work for me. The biggest change is that I write down everything I eat and I have upped my exercise. Understanding proper nutrition has never been a real problem for me, but I have not always practiced what I know to be right. I travel a lot for work – probably 70% of my time – and I have had to learn to do things on the road that help me on both the nutrition and exercise fronts. Because I eat out a lot I have had to make changes in what I order and can no longer look at a meal out as a splurge because it was making me fat. I order sauces and dressings on the side, ask the waitress to have my meals prepared with less oil, and I eat chicken and veggies and stay away from those that are prepared with added calories like cheese or sauce mixed in. I also exercise six days a week even when I am traveling. I book hotels that have fitness centers in them and take my work out clothes. I have also joined a new gym that has some really fun classes and spend a lot of my leisure time there. I no longer use my disease as an excuse to not exercise. I have found that even on my days if I get moving it relieves the pain and my fatigue is no longer a problem. I have begun training for a half marathon, but I also cycle. If I find that my knees are hurting, then I ride my bike instead. I also practice yoga regularly and lift weights. My health club has rock wall that I love to climb. The yoga, weight training and rock climbing have all helped to build muscles, and in turn has helped ease pressure on my joints. I love this site!! It is the most convenient method I have found to track my calories for food intake and exercise. I tag all the things I eat on a regular basis so I don’t have to reinvent the wheel, and it allows me to enter recipes that I make so I don’t have to calculate them individually. With exercise I have started wearing a heart rate monitor which tracks the calories I am burning and CC lets me enter that amount and keeps a log of my exercise progress. Flares from RA and traveling are by far the hardest part. When I get out on the road, traveling is grueling and it can cause me to feel badly from the RA. There are a lot of times I am exhausted, and I just want to order something bad from room service and go to bed. I have learned though that best medicine is to hop on the treadmill or a stationary bike. There is a sense of euphoria you feel after working out. Some of the fitness facilities on the road are not great, so trying to exercise there can be tough. Since I am one of those people that needs to have fun exercising in order to stay motivated I have found a few little tricks that help me a lot. For example. finding something cool to do while I am on the road like biking a neat trail or park (most towns have bike shops you can rent a road or mountain bike for the day), or running an interesting route. Sometimes none of these options are available or I don’t always have the time, so I have to persevere in the bad gym using headphones and good music. I think it took about 30 pounds for others to start saying anything to me, but I began noticing differences after about 10 pounds. The interesting thing for me though is that my journey is no longer about weight loss, but about fitness. I love working out now. I think about it, plan my week around classes, practice yoga moves at home and have made new friends who like to do active things with me. I realized I was success when I went to my in-laws for a family reunion and I took the initiative to make sure I was going to be able to eat healthy even though I splurged on some fattening foods. I made a plan, went to the store and bought healthy snacks and only ate the bad stuff that I really wanted. In the past I would have used this as an opportunity to pig out. I also set aside time to exercise every day and took the family to mountain bike in the canyon. I have a new lifestyle. This is not a diet anymore. I plan ahead. I keep healthy foods around and eat 5 or 6 times a day. I make sure I fuel up before and after workouts and I never let myself get too hungry. I have found fun exercises to do that keep me motivated. I feel GREAT. I have more energy than I have had in years. I am happy and my stress level is so much lower than it used to be. Don’t try to fix everything at once. I started with weight loss and I didn’t give up everything I loved. Make healthy alternatives for many foods that you love. a treadmill or outside like you did in high school and don’t beat yourself up for it. Exercise should be something you look forward to, not something you dread. Make it fun. Stay strong and know that the more you work towards fitness the better you will feel. 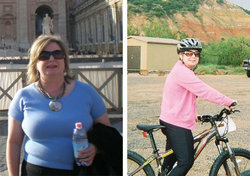 ← Previous Story Weight Loss Before and After: Theresa Lost An Amazing 276 Pounds Without Surgery! Next Story → A Brand New Me!